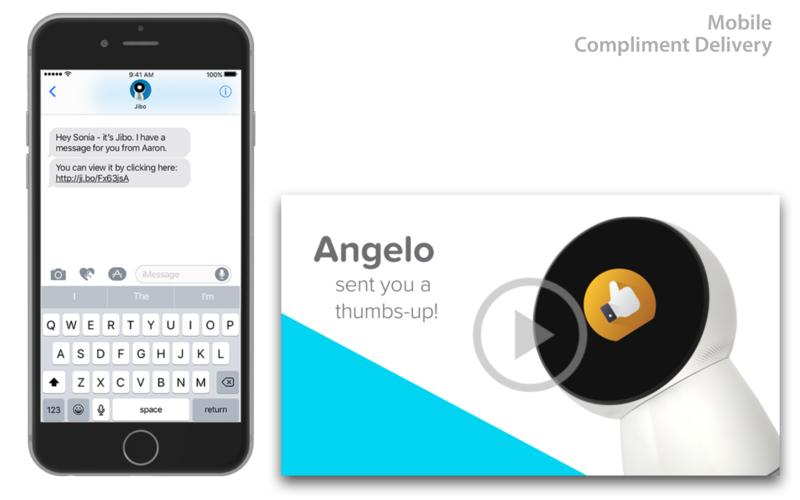 Challenge Design a multimodal conversational interface for giving and receiving compliments among friends and family. Solution I designed a skill for Jibo that helped bridge the gap for asynchronous family moments. Can bots help us become better people? The folks behind Jibo think so. As part of a design challenge, I designed Compliments as a prototype application meant to help people give and receive compliments using the Jibo robot. compliments in a charming manner. Not only did the app have to fit intuitively into users' lives - it had to fit Jibo's personality as well. 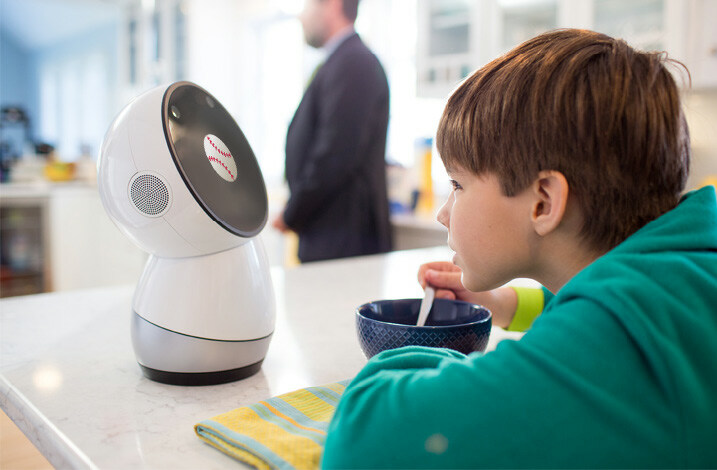 I focused my exploratory research on Jibo's target segments: early adopter types and young families. I conducted over 60 minutes of phone interviews with 3 research subjects: an early-adopter couple from Massachusetts, and the father in a young family from Madison, Wisconsin. I used an exploratory research plan to guide my questions towards understanding the human needs, motivations, and pain points on the topic of compliments. How is a compliment best delivered to make someone feel good about themselves? Look to the movies. 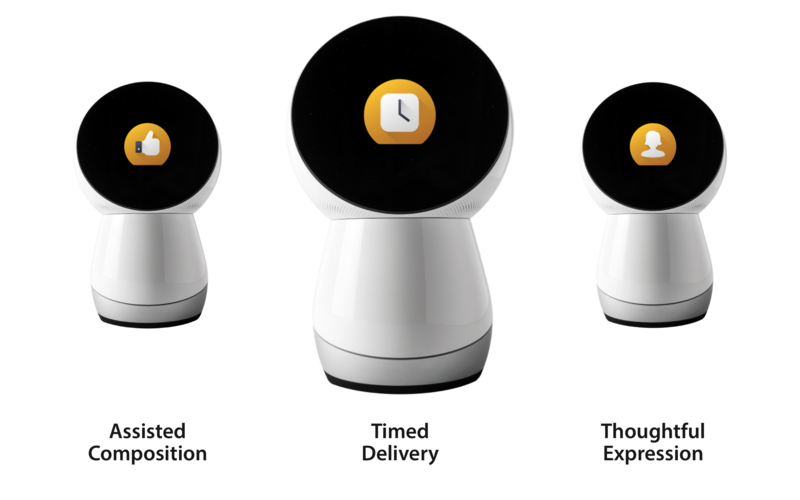 Jibo's personality exudes not only through what he says, but how he says it, through cadence, body language and semi-speech audio (SSA). With some help from YouTube, I studied the choreography of successful (and awkward!) compliments in films, to learn about how these nonverbal cues contribute to the execution of a compliment that gets the desired end result: making the receiver, and giver, feel good about themselves. My initial research helped me discover a few key insights to guide the design of Jibo's Compliments skill. The exchange of a compliment is much more than a simple statement. Actually, it's a complex and fascinating dance of observation, communication, and emotion that can occur over several interactions. Compliments always include a giver and receiver, and tend to follow a particular conversational sequence between the two. I distilled my research on this exchange into a task model that would help give Jibo's Compliment skill an intuitive rhythm. 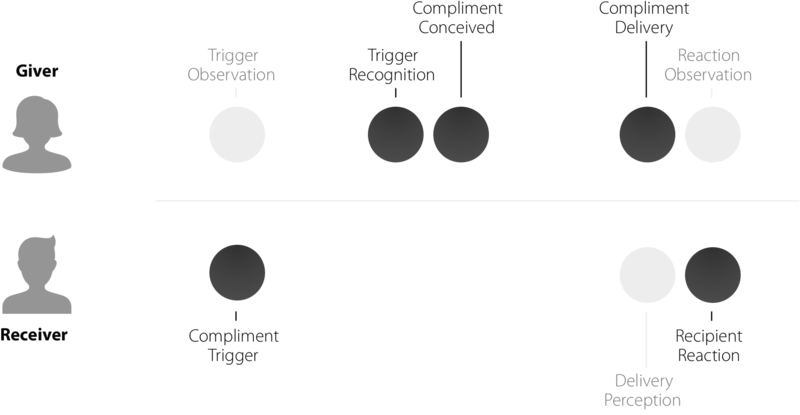 Conversational roles alternate between active and passive, as shown by the highlighted path at left. 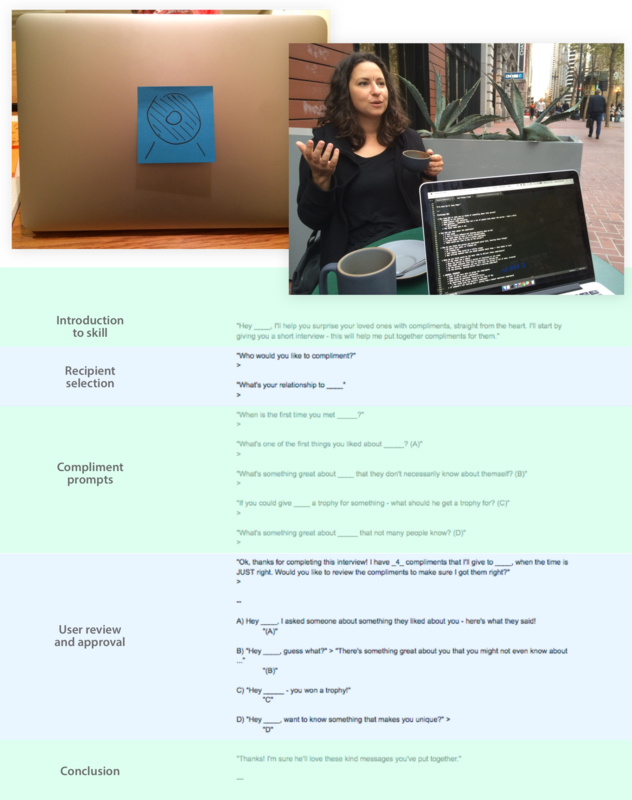 Using the UX Strategy Blueprint as a tool, I translated research insights into more actionable guiding principles for the design of the Compliments skill, as well as a set of How Might We? prompts to spur ideation. My ideation process began with a set of quick pen-and-paper storyboards that followed a user through a possible sequence of interactions. This first pass helped me identify possible snags and challenges that would require more planning and ideation. For example - should users be able to receive compliments via their phone if they're not at home? Or, how should the system leverage the existing contacts architecture? In the next phase of brainstorming, I picked apart each segment of the task model, brainstorming each stage. I generated concepts about how Jibo should initiate a new compliment, assist in its composition, delivered to a recipient, and reciprocated. I considered metaphors like trophies, fortune cookies, and badges, but eventually decided that a system of timed, pre-composed voice messages best fit the design principles developed previously. Validating needs with low-fi prototypes. Despite the simplicity of the prototype, I quickly learned important lessons: users needed time to compose a compliment for their loved one, and users became uncomfortable if Jibo 'knew too much' about them. 'Wireframing' an animated, speaking robot isn't like wireframing a mobile app. 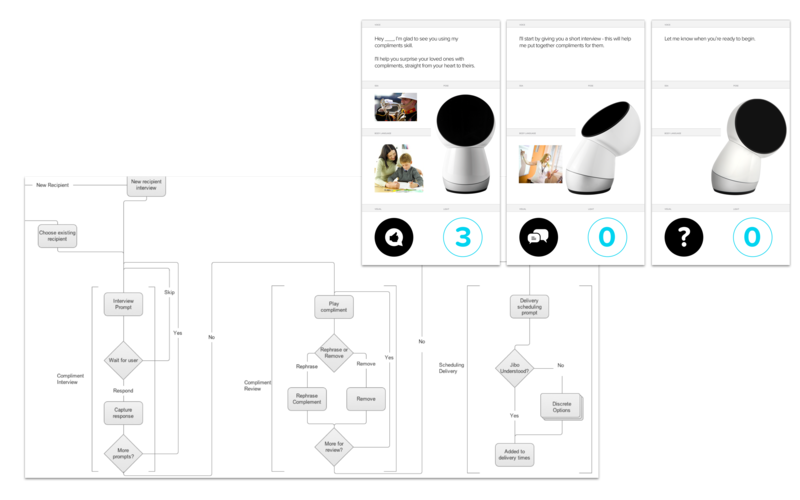 To better refine the multimodal aspects of the interaction, I developed a wireframing template that allowed me to communicate the different components of Jibo's expression, such as his words, GUI, body posture, semi-speech audio, and LED set. I also used flow diagrams to further define interaction states for the next user test. User testing a conversational, multimodal robot interaction (without incurring expensive development costs) requires some creativity.  I determined that a Keynote prototype, illustrating Jibo's body language, key GUI elements, and sounds, would be the most efficient for gathering insights at the next level of the concept. I used Ableton Live to generate sounds for Jibo, and grabbed icons from the Noun Project to 'wireframe' Jibo's GUI iconography. My second user test involved controlling Jibo's states through a Keynote remote, while the user interacted with the simulated Jibo onscreen. 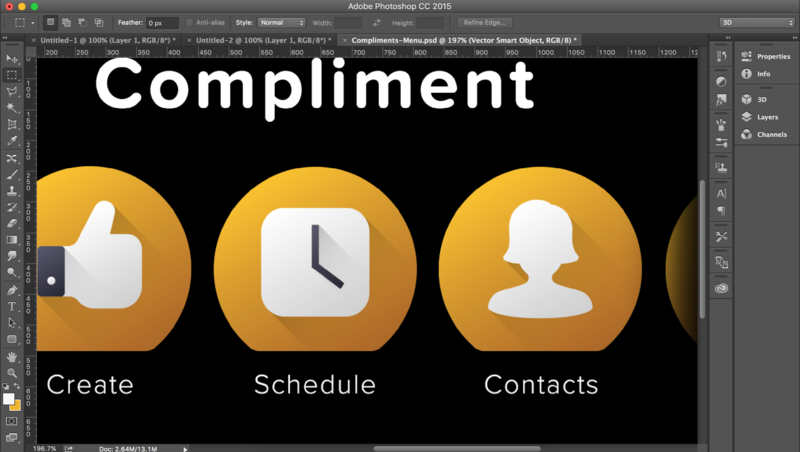 Working across Illustrator and Photoshop, I based my UI design on the Jibo's in-house iconography and GUI kit. I curated a set of icons from the Noun Project, and modified them to fit the visual character of Jibo's other system icons. 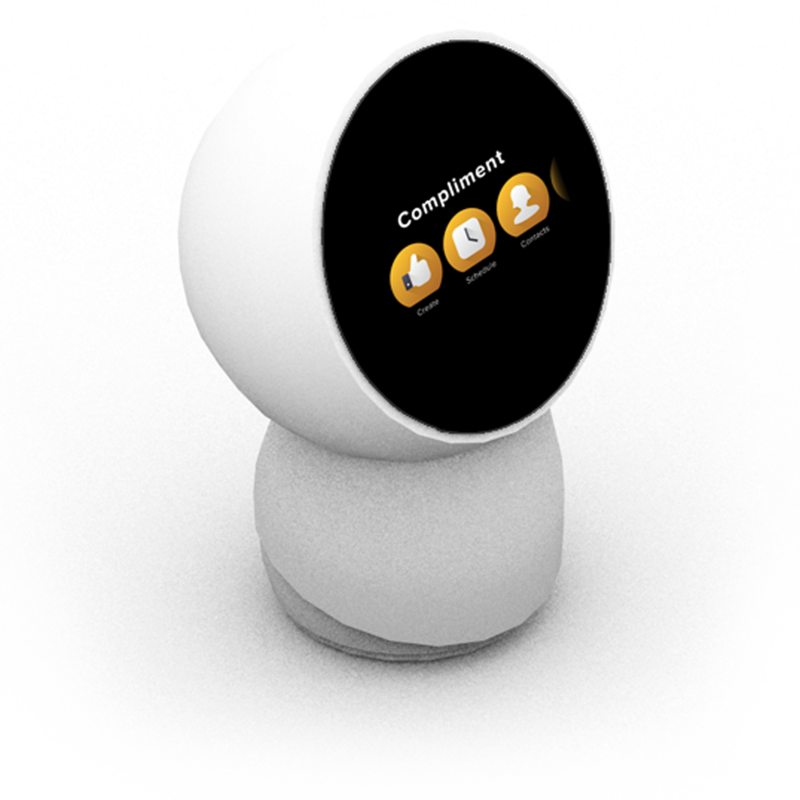 The final Compliments skill included three features that addressed core user needs. Assisted composition includes vocal prompts that comfortably guide the user towards compliments that are genuine. With thoughtful expression, Jibo’s compliments relay the message when the receiver is comfortable, to avoid making them feel self-conscious and allowing the receiver to relish the compliment. They appear like the message on a fortune cookie - slightly surprising, pleasingly affirming, but requiring no response. Timed delivery means that Jibo's words of affirmation can be there when you can't be, by drawing from your pre-composed bank of compliments when your loved ones need them the most. I also mocked up a mobile delivery option, to depict a roadmap feature that would allow Jibo owners to receive compliments outside the home. 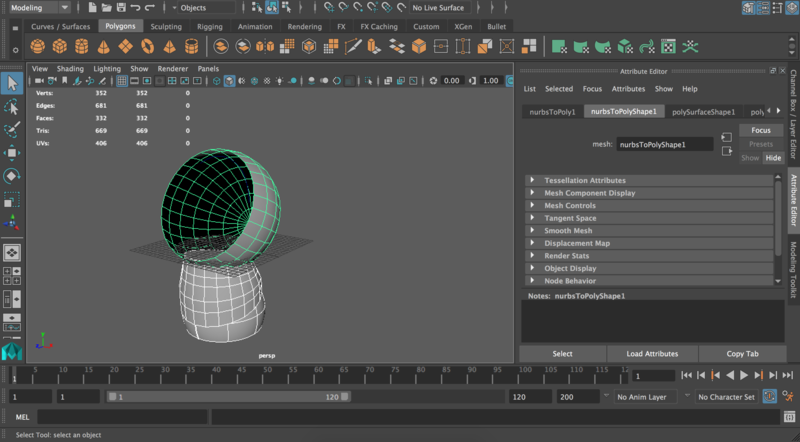 Using Maya and AfterEffects, I generated a high-fidelity mockup of Jibo's movement, SSA, and delivery of a compliment.